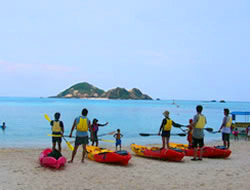 From Aharen Beach (Ajalen) beach, take a sea kayak and row out to the sea! Different views from snorkelling and diving come into my eyes. If you are a sea kayak, you control the paddle by yourself so you can go where you want to go. Row out to the uninhabited island! Let's go to the uninhabited island by riding the sea kayak! If you plan to explore the fascintating beauty of this place, don't hesitate to rent a kayak and enjoy every minute. But those who are not familiar with sea kayak, firstly we suggest you to learn more by joining the guided sea kayak tour . The uninhabited island, which is also called deserted island "Hanari island" located about 800 m from the Awa-shona (Ajalen) beach, also known as Shibagaki Island (Note 1), is a small uninhabited island with a shape like a gourd of less than 600 m in length.Guided tours are quite popular here and tourist often take a guide to accompany them to Hanaari Island.Guided tours are set up for guests to enjoy.Of course, the guide tells you how to ride the sea kayak carefully before departing, so don't worry! When I learned how to ride, I actually got on a kayak and finally got to the uninhabited island! Trust me, it's something worth to be done.However. A rocky course is set up before going to a desert island. In the rocky place, you can go through the gap between the rock and the rock with a kayak and you can go through the kayak to the cave how (though it may not pass through when the tide is overdrawn). You can also explore the living creatures that live on rocky areas. As soon as you pass through the rocky place, row it aiming at the desert island. About 30 minutes after leaving the beach, I arrived at a desert island at a relaxed pace. I landed on an uninhabited island and after a while I left for an exploration. Getting a deep expanation by the guide who accompanied me finally we got up to the mountain. When you go up to the mountain and look at Aharen Beach, a pure blue sea called Kerama Blue jumps into your eyes. A world that has only been seen in magazines and television is spreading. After taking some time to rest here, I suggest to go down the mountain: it is free time until snorkelling. It's okay to pick up the shells at the edge of the beach, so do not desperately look down at the ocean and use your free time effectively. Once the free time is over, it's finally time to snorkel. If the snorkeling is the first time, even if you are not confident, do not worry. They also offer snooker lessons for beginners. In snorkeling, go to the main point with the guide. At this point the fish peculiar to Okinawa, such as Mitsuboshi Kuroshimedayi, Amami Suzumeai, Sukashi Tenjiku Dai and Kinmokodo Doki, are crowded to such an extent. Of course it's also a must-do diving point so you can enjoy snorkeling well enough. Tour time is 3 hours and reasonable. It is half a day course so you can enjoy it well even on a day trip. There are also things to enjoy with the rental kayak, but why not try joining the tour if you want to have more fun? If you participate in the tour, the guide is familiar with the sea around here, so you can participate with peace. Because the course which guest can enjoy more than anything is set, guide can learn nature, culture, history etc of Tokashikijima by guide. Also, on the tour, you can experience uninhabited island exploration and snorkeling with guides, so it will not be doubtful to remain memories of Tokashikijima trip. Let's feel the nature from the sea! Looking back from the sea, Tokashiki Island. I unexpectedly notice Tokashikijima of mountains.
. When you look around Awa-shu (Ajalen) beach that extends beyond that, you can not see it in natural palm trees called "bellow" or inside of Takonoki family called "adan" (mainland Japan) , Subtropical peculiar plants come into my eyes. Close your eyes and listen to your ears, the sea birds cry crying, the sounds of the waves that hit the rocks, and from May to November they will hear Jersey and cicadas. When I look up to the oki, the horizon spreads over the islands of the Keerama (Kerama) archipelago and far away. When you are at the beach you will tend to see only the sea in front of you but not only the sea but also the natural scenery and sounds including the mountain, on the ocean, in the sight which opened 360 ° C, quietly I can not taste it unless it is from the sea kayak. Under the kayak is a natural aquarium! On the water surface overlooking from the sea kayak, distinctive corals and tropical fish are projected. Tokashikijima is known as a diving point to enter five fingers in the world, and is an island where divers visit throughout the year. Especially transparency (Note 2) is outstanding. It is said to boast a transparency of 50 meters when it is transparent. Of course coral reefs are also exceptional. In the snorkeling, the coral reef spreads even around 50 meters from entering the beach, Awa-Una (Ajalen) beach. I ride the sea kayak on the coral reef and go on idly. Under the sea kayak, you can see various corals such as "Edasango" like forest and "Ryukyukika coral" like cabbage. Of course, I live the coral and live in Okinawa peculiar tropical fish such as blue, yellow, orange. It is also a feature of the sea kayaking that you can easily go to see such living things from the water surface. Of course it does not have an engine etc. Power is news from yourself (or partner). It is like a small boat that moves by using a paddle called a paddle. A small boat (called a "low boat") in a park's pond and the like is rowing backwards, but the kayak faces forward and rows. In addition, the paddle is connected with the left and right, it is one, with what is called a spoon, called a blade, on both sides of the paddle (like a rope, a rope called "all" is a left and right one each, Total of 2). With this paddle, if there is no resistance of the wind, etc., going straight ahead, if you row, right, left, right, and left with a paddle. If you want to turn to the right, only the left side, if you want to turn to the left, the only row on the right handball kayak turns slowly. Although it seems to be difficult, if it receives a lecture it is unexpectedly easy, goes with Swiss I more than I thought. Those that use this kayak in the sea are called sea kayaks, those that use in the river are called river kayaks. Kayaking is also characterized by being able to go to shallow places. You can enter shallows and rocky areas where boats with engines etc can not enter without difficulty. Yes, you can even go to uninhabited islands and uninhabited beaches freely if you learn how to row. It is safe for the first time! Recently, the number of people who make kayaking a hobby is increasing. However, most people will never touch kayaks. Kayaking is surprisingly simple, even though it seems to be difficult. As power is yourself, you can proceed at your own pace. Because the paddle itself is not so heavy, even a woman can easily make a row. Also, most of the sea kayaks used at shops in Awa (Ajalen) are "sea kayak", "sit-on top type". Sit-on-top is a type of literally sitting on a sea kayak. Although the features of this kayak are not suitable for long distances, since the width of the kayak is wide, there is stability and it is characterized by becoming difficult to overthrow. Even if it is overthrown, it is unlikely to get drowned because I am wearing the life-like jacket's best life-saving gear. This type is a three-seater (two adults and one dwarf) so it is possible for fathers and mothers to go back and forth, and children and families to join in the middle with peace of mind. Of course, it is okay to have a lecture by rental, but if you are a little uneasy try participating in the experience kayaking and tour. Well, do not you go out for adventure on Shinkaiac on Shinkaiyakushima on Shinkaijiki Island! More! One point lesson to become master of Takashi! Annotation 1 · Shibagaki island: When an idol group in the 1980s, Shibugaki Corps divides (around 1990), there was a filming by a television station, and the image of Shibugaki Corps was made to commemorate the use of this Hanari Island in that shooting It was. Because of that statue, Hanaari islands, such as travel magazines, came to be called shibagaki island etc. Due to typhoons, etc., the original plastic image was broken, but in 2003 again the former member Hookin came in the shoot of the program and it was hardened with gypsum (gypsum) and repaired It is figure. Annotation 2 · Transparency: One of the water quality indicators that displays the depth of the limit, which can be discriminated from the water surface by m, by immersing a white circular plate (30 cm diameter) with a diameter of 30 cm in water. It is a value that expresses the transparency of lake and ocean water. In other words, the degree of transparency vertically from the water surface to the bottom of the water. By the way, the degree of transparency in the parallel (horizontal) direction underwater is called transparency.